CLAYTON Oliver's standout finish to the season has seen him rocket into top-10 calculations ahead of next month's NAB AFL Draft. The Murray Bushrangers midfielder, who won the TAC Cup's Morrish Medal with a brilliant second half of the year, started the season out of the picture as a draft hopeful. But with his contested ball-winning, aggressive approach at the stoppages and ability to hit the scoreboard, Oliver has come into contention as one of the most powerful midfielders in the pool. Essendon, Melbourne and Carlton have all been linked as possible destinations for Oliver inside the first 10 picks as clubs weigh up where the burly on-baller sits in their rankings. The Bombers, Demons and Blues together hold six selections inside the opening 11 picks, meaning their choices will largely shape the first round of the draft. All will be looking to boost their midfield groups at the draft, having finished in the bottom six in 2015. 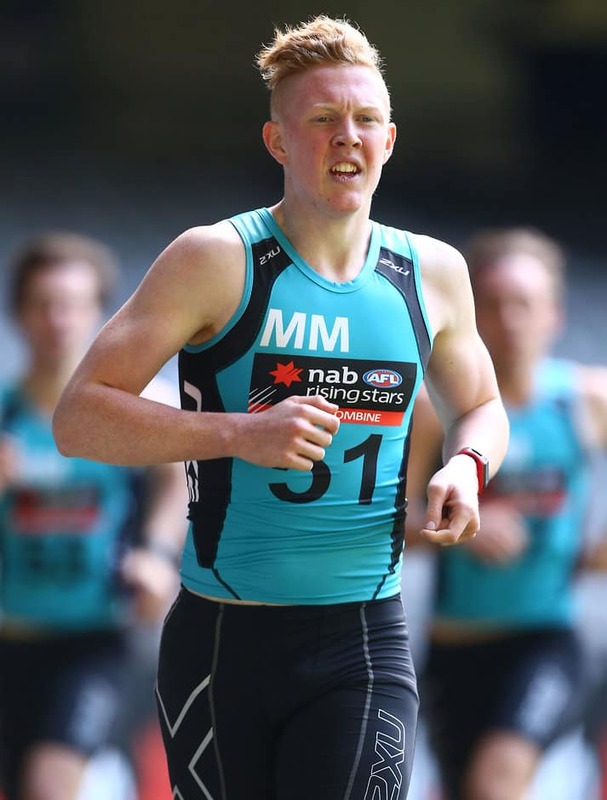 Oliver's impressive results at the NAB AFL Draft Combine capped what was a terrific end to the season. He ran a 3.00-second 20-metre time trial to show his burst of speed, and was among the best prospects in the agility test, recording a time of 8.11 seconds. He then ran the three-kilometre time trial in 10:45 minutes, a good result for the 18-year-old. Oliver transferred from the Bendigo Pioneers at the end of last year to the Bushrangers, as he lives in their region in Mooroopna in country Victoria. He started the season with a bout of osteitis pubis and couldn't break into Vic Country's team for the under-18 championships, but he struck form for the Bushrangers at TAC Cup level. In Oliver's 16 games for the club this season, the 186cm prospect averaged 24 disposals (14 contested) and six clearances. He also showed his power in attack by kicking 20 goals for the season, including a six-goal effort in the final round which clinched him the Morrish Medal. In three games for Richmond's VFL team he also averaged 15 disposals at 72 per cent efficiency. The top-end of this year's draft remains unclear just over three weeks before names are called at the Adelaide Convention Centre. Carlton is expected to take key defender Jacob Weitering with the first pick and the Brisbane Lions are tipped to draft goalkicking forward Josh Schache with the No.2 choice. But after that a number of names continue to be linked with the next group of picks, including key forwards Charlie Curnow and Sam Weideman, midfielder Darcy Parish and half-forward Wayne Milera. Oliver has also come into considerations, with South Australian defender Aaron Francis a chance to be available at the Crows' first pick at No.9.